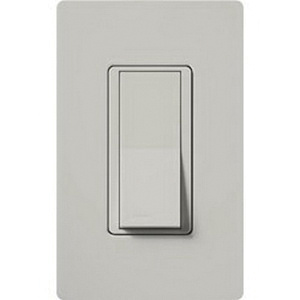 Lutron Claro® Satin Colors® 3-Way General-purpose rocker switch in palladium color, has voltage rating of 120/277-Volts and current rating of 15-Amps. It measures 2.94-Inch x 1.61-Inch x 4.69-Inch. Switch with paddle turns ON/OFF action, has satin finish. It has back wiring for easy installation. It is suitable for commercial and residential applications. Switch is cULus listed and CSA certified.